What is an RN to BSN Program and Degree? What Does RN to BSN Mean? Simply put, an RN to BSN program is a delineated set of courses that allows Registered Nurses (RN) to earn a Bachelor’s of Science in Nursing (BSN) degree, without repeating classes or losing credit for education already completed. It is the fastest and easiest way to transition from a Diploma or Associate’s degree in Nursing to a Bachelor’s degree in nursing. Background: Why Are RN to BSN Programs Necessary? There is a pressing need to increase the supply of baccalaureate-trained registered nurses in this country. Both because of the aging population of retiring baby boomers and the additional millions insured through the Affordable Care Act, the entire health care system is under stress. In 2014, the American Association of Colleges of Nursing (AACN) reported on the nursing shortage: by 2022, there will be a demand for 1.05 million registered nurses both to fill job openings and to replace retired nurses. Studies conducted in the early 2000’s showed that hospitals with more bachelor level nurses have lower patient mortality rates and a higher level of improved patient outcomes. This was followed by a push to increase the number of registered nurses who have been trained at the bachelor’s degree level. Earning your BSN may position you for the nursing role you’ve dreamed of. Advanced training is needed to impart new knowledge in medical science and medical technology and also to provide leadership skills for the expanding roles that nurses are expected to fill. Hospitals and other medical services today prefer to hire baccalaureate trained nurses, and many facilities require that pediatric nurses, nurse anesthetists and operating room nurses hold a BSN. What Do RN to BSN Programs Entail? The RN to BSN program was developed as one of the ways to meet the demand for highly educated nurses, without decreasing the number of practicing nurses overall. It is designed to facilitate bachelor’s degree attainment for working registered nurses with diplomas or associate degrees. There are now over 700 programs nationwide offering RN to BSN degrees. Besides full time on-campus programs, numerous online programs are available. There are also hybrid programs that accommodate working nurses with weekend or once-a-week courses. The programs generally require 120 credits and take about two years to complete. However, the online and hybrid options enable students to move faster through the program and reduce the time to 12 to 18 months. In selecting a school, you should make sure that the nursing program is accredited by the Commission on Collegiate Nursing Education (CCNE) or the Accreditation Commission for Education in Nursing (ACEN). What Are The Admission Requirements for RN to BSN Programs? Many programs have flexible scheduling options and will provide credit for previous training and work experience to create the shortest path to the BSN. It’s to your advantage to inquire at several schools to find those most accommodating to your educational and financial needs. What Courses Will I Take in an RN to BSN Program? The program will start with foundational courses in sciences, communication, social sciences, statistics, nutrition and nursing. According to the U.S. Bureau of Labor Statistics the average annual salary in 2014 for registered nurses nationwide was $69,790. The top 10 percent averaged more than $98,880 (BLS, 2015). While earning your BSN does not guarantee you a higher income, you will likely be qualified for higher paying positions and those in leadership with a Bachelor’s degree. Registered nurses with bachelor’s degrees can find new and varied opportunities as they enter the workforce. Nurses will increasingly fill the roles of preventive care and care coordination. They will work as partners on interdisciplinary health care teams. 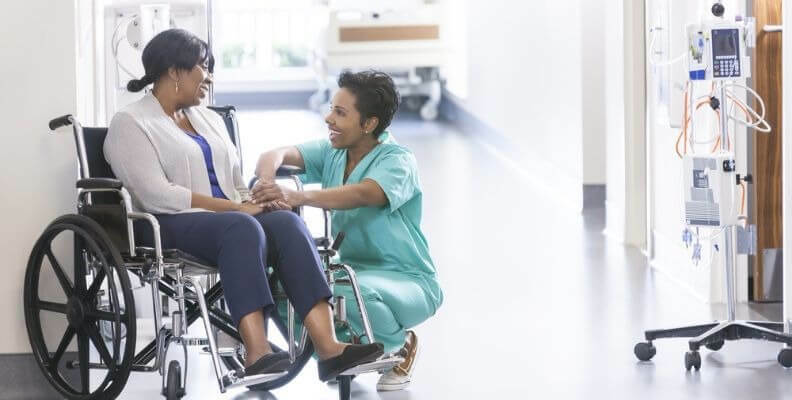 A new role of Attending Registered Nurse (ARN) is being implemented in hospitals where the ARN builds a relationship with a patient/family and maintains this relationship for the duration of the hospital stay and after discharge. The ARN ensures that the patient’s care plan is being followed by the health care team. These and other exciting opportunities await the RN who has completed the BSN. To learn more about the RN to BSN opportunities in your area, visit our program page, which lists all the schools with RN-BSN bridge programs.